Being close to the beach is the ideal situation for those looking for a great tropical adventure as Villa Bond offers you just that! With three-bedrooms, this closed-off private villa is a contemporary holiday retreat with comfortable interiors and a lavish and expansive outdoor yard. Villa Bond is a great place for the utmost relaxation as it offers peaceful and tranquil surroundings to its guests. 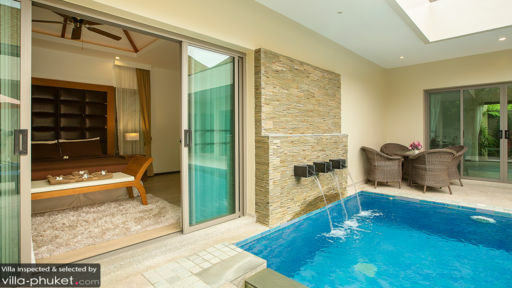 Relax and unwind as you enjoy a luxurious stay at one of the best villas in Phuket! The master suite opens out to the swimming pool and is furnished with a king-sized bed which sits facing the glass doors. There is a leathered headboard for the bed, giving the room an opulent vibe. There is a cosy sitting nook besides the windows to make for the perfect place to be engrossed in a good book. Like the living area, the master room also has a high-ceiling with a large fan. The air-conditioned room has a private en-suite bathroom with a large bathtub and shower-area. 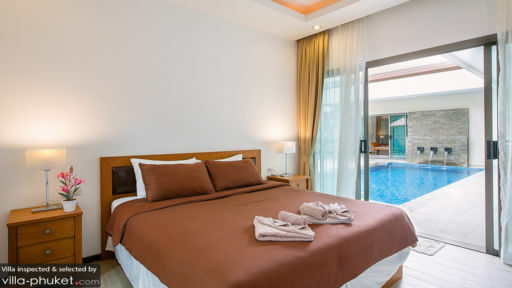 The two other rooms at Villa Bond are each furnished with king-sized beds and give you the luxury of opening your doors out to the swimming pool. As everything is interconnected, the villa is fairly convenient for the guests. Both rooms are air-conditioned and have their own en-suite bathrooms fitted with modern amenities. A beautiful swimming pool lies under a clear sky, bordered by abundant tropical foliage in the villa. You can spend hours in the outdoors playing around in the swimming pool or lounging on one of the sun loungers placed around it on the pool deck. The refreshing space with its natural greenery is a great way to begin your day, and you can sit on the outdoor dining area and have your morning tea. The rattan chairs compliment the stone-wall water feature that feed the swimming pool in a serene and meditative stance. The sun loungers are placed under the shade of large umbrellas, where you can even indulge in an afternoon siesta. The beautifully decorated living area is a nice, breezy, and well-lit room with a lot of open spaces and the open plan style ensure that it is bright and happy at all times! 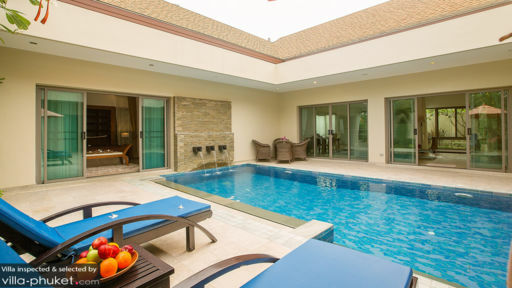 The room opens out to the pool deck, giving your direct access to swimming pool. With a neutral palate and wooden panels, the living area is a sophisticated space furnished with plush couches and chairs, pointing towards a flat-screen TV. The aesthetics are high on the ceiling on the room which gives the ambience of a luxurious and exotic enclosure. A dining area is also in place for the guests, with a dining table which can seat up to 6 people easily. Towards the back there is a smaller garden with ample natural greens. A fully-equipped kitchen is also accessible and is fitted with modern amenities and appliances for the guests. The staff at Villa Bond is exceptional at what they do and is always ready to help you, in case you need any assistance. There will be housekeeping and maintenance of the premises and you don’t need to worry about a thing. Naiharn beach and lake are only a stone’s throw from the villa, and other beaches like Rawai beach are also a few kilometres away. You can spend some time at the beach during the day and once the sun sets, head on over to one of the many restaurants that offer a variety of cuisines!